Today marks the auspicious anniversary of one of the most significant dinosaurs ever described: Dynamosaurus imperiosus! Surely one of the greatest and most fearful of all of the predatory dinosaurs, it stomped through the Maastrichtian of Wyoming and other parts of western North America. Dynamosaurus is noteworthy for its diagnostic dermal plates, which ran in transverse rows down its body and which formed a large knob of bone at the end of the tail. The function of these plates are still hotly debated, but they certainly gave Dynamosaurus a unique look among theropods. 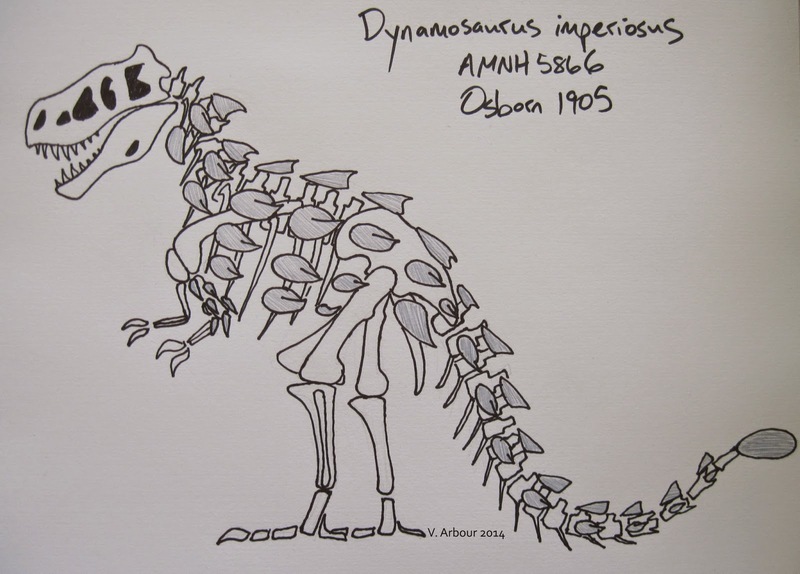 I kid, of course, but I think Dynamosaurus deserves a mention on its more famous relative’s naming day as well. Tyrannosaurus, Dynamosaurus, and Albertosaurus were all named by Osborn in 1905 and although Tyrannosaurus and Albertosaurus have proven to be distinct from each other, Dynamosaurus turned out to be a junior synonym of Tyrannosaurus. If Tyrannosaurus hadn’t appeared first in the publication, good ol’ T. rex might not be the household name it is today and we might all stand and gape at Sue or Scotty or Stan the Dynamosaurus. The distinctive osteoderms are probably Ankylosaurus osteoderms, although I haven’t attempted to track down the specimens myself or any papers that discuss their identity, so I suppose they could also be Maastrichtian nodosaurid osteoderms. Updated 2 October 2015: Last year when I fired this off quickly I completely forgot that the Dynamosaurus osteoderms are figured in Ken Carpenter’s 2004 Ankylosaurus paper! Anyway, happy birthday, Dynamosaurus. I still like you, even if you never existed. Osborn HF. 1905. Tyrannosaurus and other Cretaceous carnivorous dinosaurs. Bulletin of the AMNH 21: 259-265. Osborn HF. 1906. Tyrannosaurus, Upper Cretaceous carnivorous dinosaur (second communication). Bulletin of the AMNH 22:281-296.